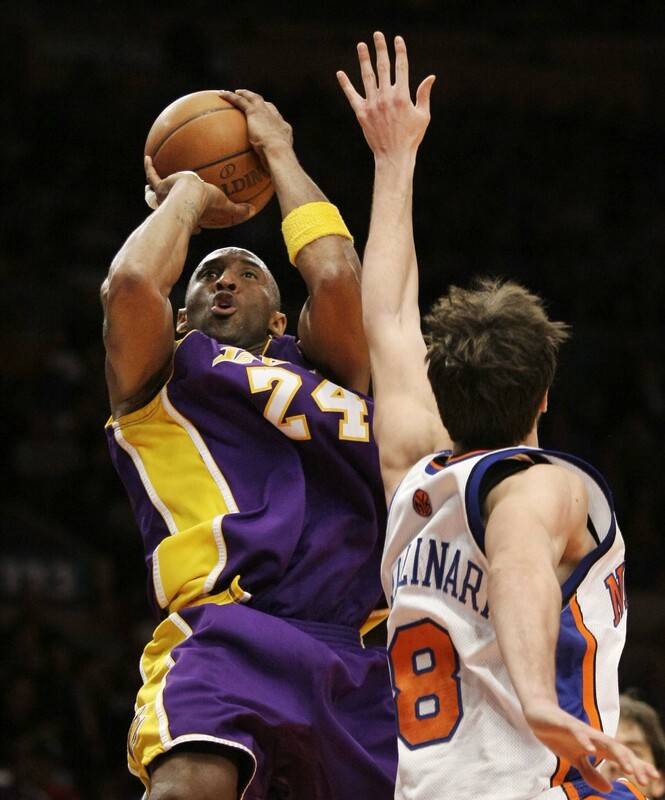 Kobe Bryant broke the record for the current Madison Square Garden with 61 points, and the Los Angeles Lakers looked plenty potent without Andrew Bynum in a 126-117 victory over the Knicks in New York. Bryant bettered Bernard King’s mark of 60 points at MSG, set on Christmas Day 1984, with two foul shots with 2:33 to play. Bryant, who also finished with the highest-scoring game in the NBA this season, left to a loud ovation after the 24th 50-point game of his career, and fifth of 60 or more. It was also his fifth 40-point game in the Garden. Pau Gasol added 31 points and 14 rebounds in the Lakers’ first game since losing Bynum, their starting center, for eight to 12 weeks with a torn medial collateral ligament in his right knee. •Blazers take down Hornets: LaMarcus Aldridge scored 22 points, and the Portland Trailblazers overcame a 17-point deficit after Chris Paul was injured for their fifth straight victory, 97-89 over the Hornets in New Orleans. Paul left the game late in the third quarter with a strained right groin, the first action he has missed for the Hornets all season. •Spurs down Warriors in OT: Tim Duncan scored five of his season-high 32 points in overtime and the San Antonio Spurs overcame a 12-point deficit in the fourth quarter to beat the Golden State Warriors 110-105 in Oakland Calif.
Manu Ginobili also had a season-high 32 points for the Spurs. Craig Hartsburg lasted less than one season with the unraveling Ottawa Senators, who suddenly have a revolving door behind the bench. Unable to turn around a team that reached the Stanley Cup finals in 2007, Hartsburg was fired as coach just 48 games into a season in which the Senators have the NHL’s third worst record. The Senators made their first trip to the finals two years ago and now are likely to miss the playoffs for the first time in 13 seasons. The decision to replace Hartsburg with Cory Clouston was made by general manager Bryan Murray after Ottawa lost 7-4 at Washington on Sunday. Hartsburg signed a three-year deal in June. •Hossa nets Red Wings winner: Marian Hossa had the game-winner in a shootout after scoring twice in regulation, lifting the Red Wings to a 4-3 victory over the St. Louis Blues in Detroit. Barret Jackman scored midway through the third period to extend the game after rookies T.J. Oshie and Patrik Berglund scored tying goals in the second for the Blues. •Beanpot finals set: Chris Donovan had a goal and three assists, Brad Thiessen made 45 saves and Northeastern beat Boston College 6-1 in the semifinals of the 57th annual Beanpot in Boston. The Huskies will face Boston University for the tournament title next Monday. The top-ranked Terriers pulled out a surprisingly tough 4-3 win over Harvard in the opener. Pat Summitt’s 1,000th win will have to wait at least another game. Courtney Paris’ record 112-game double-double streak came to an end, but Whitney Hand matched her career high with 20 points to help No. 2 Oklahoma (19-2) beat 12th-ranked Tennessee 80-70 in Oklahoma City. Summitt was denied in her first attempt at reaching the coaching milestone. She’ll get another chance Thursday when the Lady Vols (16-5) play host to Georgia. Paris had nine points and 12 rebounds and got a standing ovation when she fouled out with 38.2 seconds left. •Maryland edges Florida St.: Kristi Toliver’s 3-point shot as the buzzer sounded lifted No. 13 Maryland (17-4, 5-2 ACC) to a 72-71 win at Florida State in Tallahassee, Fla., snapping the 15th-ranked Seminoles (18-5, 6-1) nine-game winning streak and handing them their first conference loss. •Huskies play like top dog: Connecticut looks pretty comfortable as the men’s No. 1. Jeff Adrien scored 18 points and grabbed seven rebounds and the Huskies (21-1, 10-1 Big East) celebrated their return to the top of the polls for the first time in three years with a 68-51 dismantling of No. 5 Louisville (17-4, 8-1) in Louisville, Ky.
Hasheem Thabeet added 14 points, 11 rebounds and four blocks for the Huskies. •No. 11 Butler stunned: Ryan Tillema scored 21 points and Wisconsin-Green Bay (18-6, 10-2 Horizon League) was almost perfect from the free-throw line (32 of 35) in a 75-66 upset of Butler (19-2, 10-1) in Green Bay, Wis. The Chicago Cubs traded right-handed reliever Michael Wuertz to the Oakland Athletics for a pair of minor leaguers and sent left-hander Rich Hill, their starter in Game 3 of the playoffs two years ago, to the Baltimore Orioles for a player to be named. In the Oakland deal, the Cubs received outfielder Rich Robnett and infielder Justin Sellers. •Mets, Perez agree to deal: Oliver Perez and the New York Mets reached a preliminary agreement on a $36 million, three-year contract. •Braves avoid arbitration: Casey Kotchman and the Atlanta Braves avoided salary arbitration, agreeing to a one-year contract worth $2,885,000. The Obama administration is sending a women’s badminton team to Iran this week as part of a broad bid to engage the Iranian people through educational and cultural exchanges, officials said. The team – eight female players and four coaches and managers – will be in Tehran today until Feb. 9 to participate in the Iran Fajr International Badminton Tournament, which begins on Friday, the officials said. The officials spoke on condition of anonymity because the visit has not yet been announced publicly.